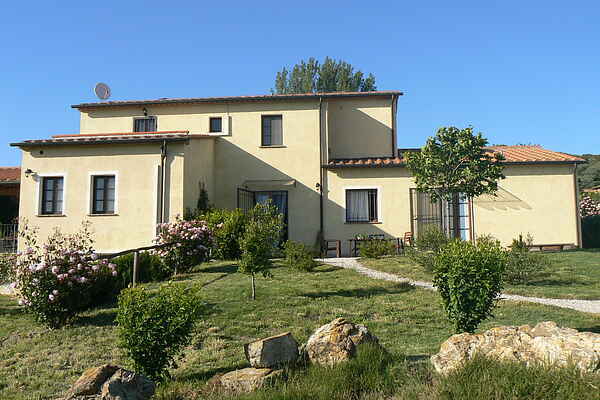 You are bound to enjoy yourself in this pleasant, spacious villa situated up in the hills by Monteverdi Marittimo. Enjoy the enclosed private swimming pool with outdoor shower and loungers. Start a new book on the terrace or under one of the olive trees in the enclosed garden. All the bedrooms in the villa have their own bathroom. The interior is light, charming and peaceful. From the living room, open the door out on to a spacious, covered terrace with a large dining room table and views of the hillsides. The two bedrooms upstairs and one bedroom on the ground floor have airconditioning. There's also a large barbecue! In the little village of Monteverdi Maritime (1.5 km) you will find restaurants, a bank and a supermarket. It is well worth your while to stroll around the town and enjoy a cappuccino on a terrace. Suverto (8 km) is also a nice village to stroll around. The village is in the middle of a wine trail. Make sure to visit the Palazzo Communale or the church of San Giusto. North of Suvereto is the Archaeological Park of San Silvestro. Take a trip through time and visit the old mines and tunnels that the Etruscans left behind here. Ideal location for those who want to spend a holiday far away from the daily stress of the city. Monteverdi Marittimo is a small village surrounded by countryside and small villages, you can breathe a rustic air and live a real Italian vacation. The coast is easy to reach and there are beaches recommended for those who want to spend a pleasant sea day: San Vincenzo, Marina di Castagneto Carducci and a bit farther Baratti and Populonia. We recommend the visit of Volterra, Colle Val d'Elsa, San Gimignano and Monteriggioni - typical Tuscan villages with breathtaking views and characteristic restaurants that will make you fall in love with Tuscan cuisine.